Hours after fans were teased with a short clip during the Super Bowl, "Good Morning America" exclusively debuted the first full trailer for "Solo," which features the back story for everyone's favorite scoundrel from a galaxy far, far away. Add Star Wars as an interest to stay up to date on the latest Star Wars news, video, and analysis from ABC News. In the two-minute trailer -- we first meet Han Solo, the "Star Wars" icon -- long before he met Luke and Leia or became a hesitant hero fighting the Empire. "I've been running scams on the street since I was 10," Alden Ehrenreich, who plays the young Solo, says in the clip. "I was kicked out of the flight academy for having a mind of my own." Solo, well before the events of "Star Wars: A New Hope," also talks of one day becoming the best pilot "in the galaxy." Other characters who debuted in full "Star Wars" garb for the first time in these first clips include Donald Glover's young Lando Calrissian and Emilia Clarke's Qi'Ra (her character's name according to IMDB). "I might be the only person who knows what you really are," Clarke's character tells Solo, the clip hinting that they might be friends or have had some kind of previous relationship. The action revs up in Monday's first trailer too, with Solo showing off his flight skills before the Millennium Falcon almost crashes into the craziest, kracken-style space monster that "Star Wars" fans have ever seen as the clip comes to a close. The full trailer comes on the heels of a 45-second clip that aired Sunday night during the big game. In that clip, fans saw similar footage, where a young Han is asked what he wants to be. "I'm gonna be a pilot," he says. 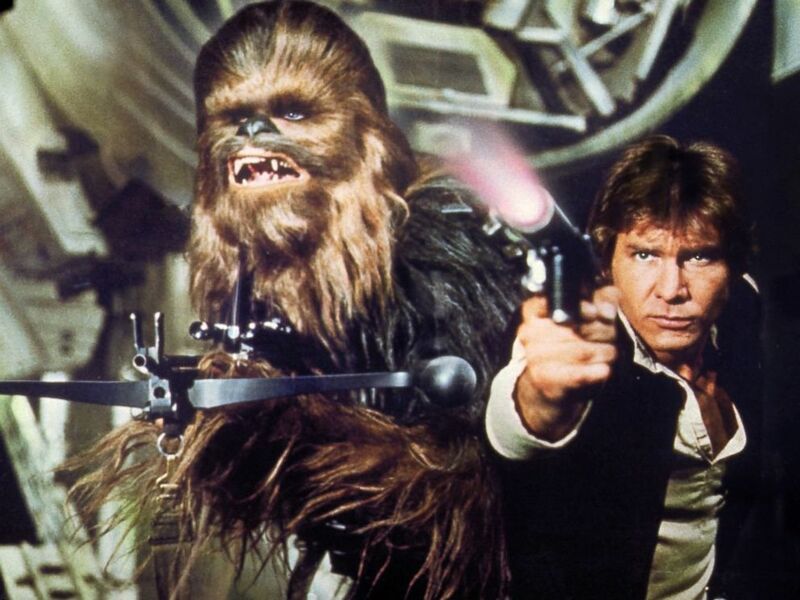 Peter Mayhew, left, as Chewbacca and Harrison Ford as Han Solo in a scene from "Star Wars: Episode IV - A New Hope." "The movie will explore the duo’s [Han and Chewbacca] adventures before the events of 'Star Wars: A New Hope,' including their early encounters with that other card-playing rogue from a galaxy far, far away, Lando Calrissian," an official release from last year revealed about the film that will tell the origin stories of the characters Harrison Ford, Billy Dee Williams and Peter Mayhew made famous almost four decades ago. "Solo" hits theaters on May 25. ABC News and Lucasfilm are both owned by parent company Disney.